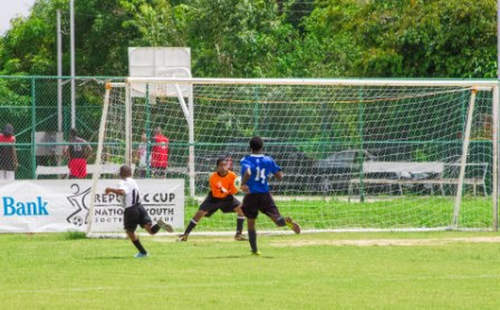 The SKHY FC and QPCC football clubs will battle for a solitary quarterfinal berth at the Queen’s Park Savannah tomorrow as action continues in the North Zone of the 2015 Republic Bank National Youth Cup. 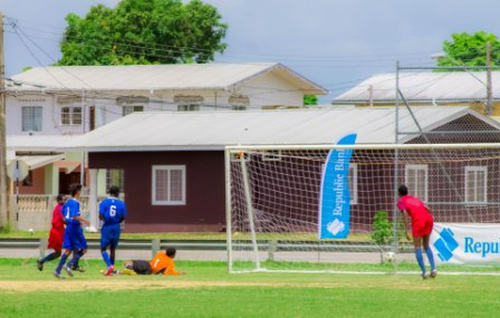 Photo: A Crown Trace FC attacker (left) squeezes his shot past the Todd’s Road goalkeeper during Republic Bank National Youth Cup action. 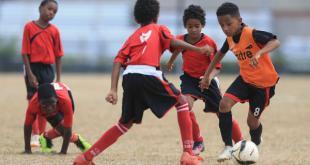 Matches will be played in the Under-11, Under-13 and Under-15 divisions of the North Zone on Saturday August 15 while the national youth football competition heads to the South Zone on Sunday August 16. 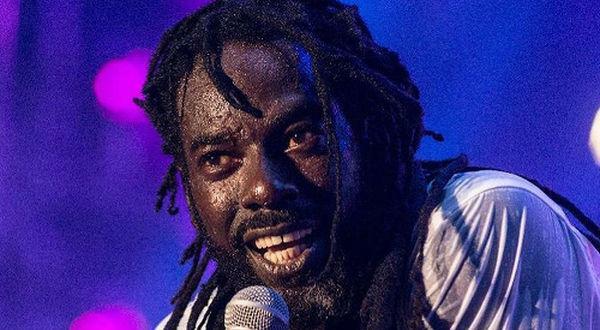 Group and/or zonal winners will advance automatically to the Republic Bank Cup’s national quarterfinal stage, which kicks off on Saturday August 22. 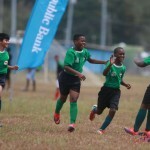 Tomorrow’s North Zone fixtures will take place at the Casuals Corner of the Queen’s Park Savannah (just north of the US Embassy) while the South Zone matches will be held at Guaracara Park. 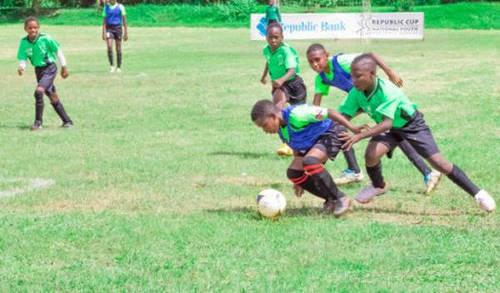 SKHY will be first on to the Queen’s Park Savannah field tomorrow and the Tacarigua-based club would hope to continue its early dominance in Group A of the North Zone’s Under-13 division. It would help if Justin Araujo continues his hot streak as the attacker notched successive doubles last weekend in a 4-1 win over QPCC FA and a 3-1 triumph against P&D Coaching School respectively. 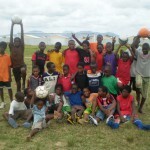 One win from SKHY’s two Under-13 fixtures tomorrow will virtually seal the club’s ascension to the knock out rounds. 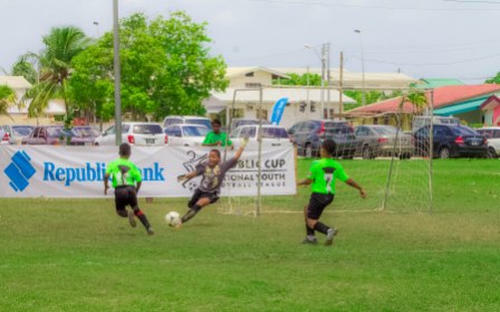 Incidentally, if successful, SKHY will be the second east-based clubs to cruise through the North Zone qualifying rounds, after La Horquetta finished atop the Under-11 division in Group A last weekend. 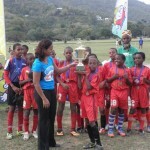 But the ‘Capital clubs’ can restore some pride tomorrow when Trendsetter Hawks takes to the field in all three divisions and St Ann’s Rangers compete in the Under-13 and Under-15 categories. No doubt, Santa Cruz FA, Memphis FC and Caledonia United AIA will try to maintain the early eastern dominance as they also try to book quarterfinal berths in their respective categories. 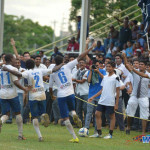 In the South Zone, three categories will be decided on Sunday at Guaracara Park as: Point Fortin Civic, Uprising Youths, WEZ Pro, St Madeline Strikers, Gasparillo Youths and Club Sando will all battle for the chance to participate in the knockout rounds. Photo: A Cap Off Youths Under-11 player dribbles past an Edinburgh 500 YFA opponent during Republic Bank National Youth Cup action. Cap Off Youths won 7-1. 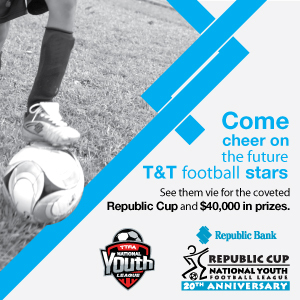 Under-15: Cap Off Youths (Central Zone), San Juan Jabloteh, WASA FC (East Zone), 1976 Tobago Phoenix FC (Tobago). There will be a Play Off in the Under-13 category between the two group winners with the lowest point totals who played just three matches. Photo: Cap Off Youths score their third goal in a 4-0 triumph over Edinburgh 500 in Republic Bank National Youth Cup action. 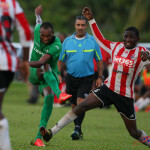 Photo: Action in the Republic Bank National Youth Cup.